LoopUp kicked-off 2019 by taking part in a mix of exciting events across the globe. 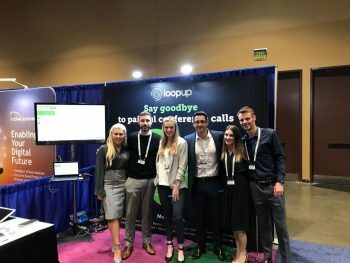 From the UK to Australia and North America to The Netherlands, the LoopUp team were on hand to showcase our premium remote meetings solution and discuss everything from conference call security to the future of collaboration. 1) When it comes to implementing new digital technologies in a workplace, employee adoption remains the biggest barrier. 2) There is a growing threat around unsecure devices in an increasingly integrated working environment. In case you missed us at any of the events this year…we thought we would share some of our highlights! The 12th Managing Partners’ Forum was the first of many events for LoopUp down-under this year, and it was our first time attending this Chilli IQ event. Discussions focussed on the changing world of technology and its future impact on the efficiency, processes and communication of the legal sector. Professionals across the Australian legal industry came together for this two-day conference to discuss the trends shaping the future of the digital workplace. We heard from speakers from Harvard Law School, Microsoft and Deloitte, addressing some of the biggest challenges in the Australian legal sector and looking to the future of legal service. 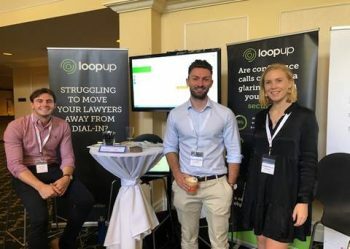 LoopUp were proud sponsors of the event and our Australian team was exhibiting at the show. We enjoyed a lot of interesting conversations around the evolution and adoption of communication tools and the shifting tides of collaboration in the modern workplace. 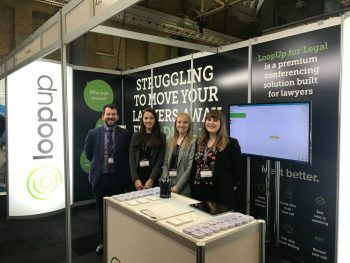 This was LoopUp’s third time attending the British Legal Technology Forum, organised by NetLaw Media. This year, the London-based event generated more buzz than ever before, with attendees stopping-by for a G&T at the LoopUp sponsored Gin Bar. The anticipated event brought together over 1,200 of the most respected professionals from world of law, legal technology and IT security to examine and explore the systems, strategies, processes and platforms that will drive law firms and legal businesses into the next decade and beyond. With four presentation stages and over 2,500 square metres of exhibition space, The British Legal Technology Forum hosted multi-stream conference sessions, keynote presentations, panel discussions, knowledge sessions, interviews, interactive demonstrations and exhibitions by over 100 of Europe’s best-known technology and IT security suppliers. The theme for this year was ‘Technology and Security’ with a particular focus on the burgeoning legal tech start-up scene. The opening chair Professor Richard Susskind, explained that this market expansion was driven by the increased availability of private equity finance, coupled by the growing awareness of legal tech by in-house lawyers. Of all the issues discussed, arguably the hottest BLTF topics were cybersecurity, AI and blockchain. 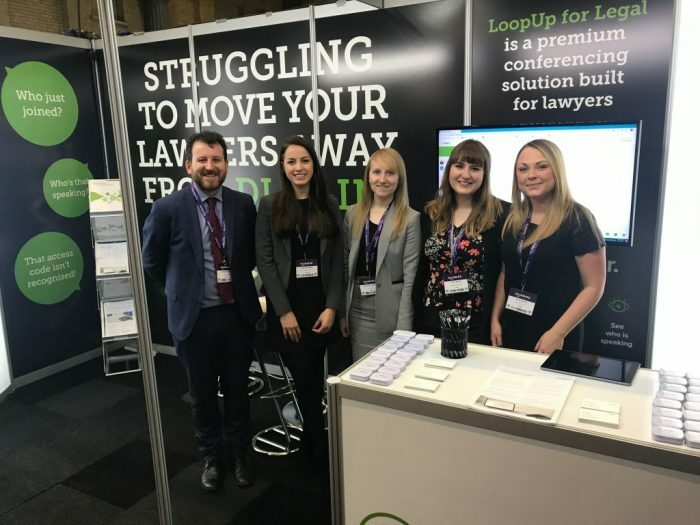 As a Bronze Sponsor of the event, LoopUp were exhibiting at the show and hosting the Gin Bar throughout the day. We enjoyed a busy few days exhibiting at Enterprise Connect, in Orlando last month. This was our third time attending the 4-day expert-led conference, which focusses on the latest systems, software, services and applications for enterprise communications and collaboration. For more than 28 years, Enterprise Connect has been the leading conference and exhibition for enterprise communications and collaboration in North America. Enterprise Connect, organised by UBM Technology Group, brings corporate IT decision makers together with the industry’s vendors, analysts and consultants to focus on the issues central to enterprise communications and collaboration. Enterprise Connect adopts a vendor neutral conference program, comprising of over 60 sessions and featuring speakers from Walmart, Amazon and Google. The main theme this year was ‘Empowering Your Organisation Though Collaboration,’ with the majority of presentations looking at how enterprises can take a more holistic view of communications. A particular highlight for us was participating in the Enterprise Connect Booth Crawl. It gave us the opportunity to showcase LoopUp’s intuitive conference calling solution to senior decision makers across a variety of industries. The LoopUp team held product demos at our booth, showing visitors how to join meetings, add guests, and screenshare with a single click. Don’t miss us at this month’s Lexpo19 in Amsterdam! We will be exhibiting and speaking across both days, alongside experts within the legal industry. Lexpo is organised by Asfour, in cooperation with Legal IT Professionals and Legal IT Today. The key themes for 2019’s event are Collaboration, Differentiation, Valuation and Cyber Security and the event plans to showcase all the latest trends in legal innovation. Make sure you drop by Stand S7 to find out about all the exciting things we are doing in the world of conference calling and remote meetings! Andrew Birch, Senior Director, Global Sales at LoopUp will be hosting a roundtable on both days from 14:15 – 15:45pm in Conference Room, Third Floor. The discussion topic will be ‘Barriers to user adoption of digital technology in the legal sector’ and will focus on why so many new digital technologies lack buy-in from legal teams? Andrew Birch will also be presenting ‘From Dial-in to Dial-out: How Clifford Chance transformed their remote meetings’ on Tuesday 9th at 12:15 – 12:40pm in Conference Room, Third Floor. In this session, Andrew will showcase how Clifford Chance transformed their approach to conference calling by adopting a solution designed specifically for the needs of legal and other professional services firms. The discussion will touch on how the new system was deployed across a multinational business, how lawyers at Clifford Chance are using LoopUp and the benefits for the firm and individual users. Stay tuned for more LoopUp events by following us on Facebook, or Twitter.